I’ve read a fair amount on the importance of morning and before-bed routines, and have been slowly creating versions of them that work for me. But frankly, the evening part has been a struggle. It seems I always have just enough energy and drive do complete tasks for self-care or house-care, but rarely both. Or if I do both, I’m wide awake again by the time I hit the bed. This week, I had a brand new epiphany that I couldn’t wait to share with you! 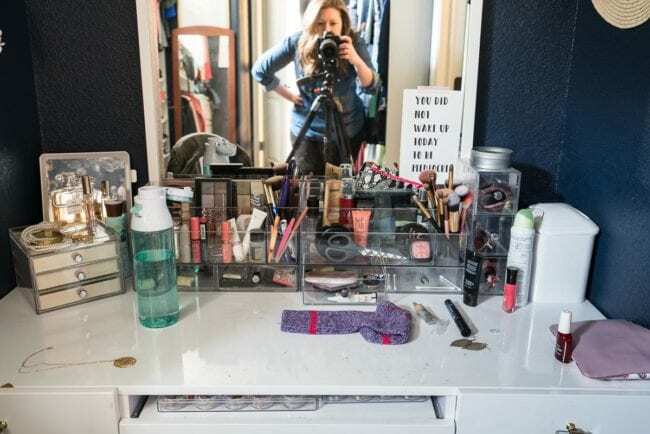 I’ve documented it pretty well over the years that my natural state is a bit messy, but that I know I’m a more productive and pleasant person when everything is neat and clean. Why have I never thought to create a simple after-dinner routine? Now, the house gets some love for about 15 minutes right after dinner. The key is doing this BEFORE we plop down on the couch to relax with a book or some TV. To figure out my priorities and keep this routine manageable, I wanted to specifically focus on tasks that made the morning easier or just more pleasant. 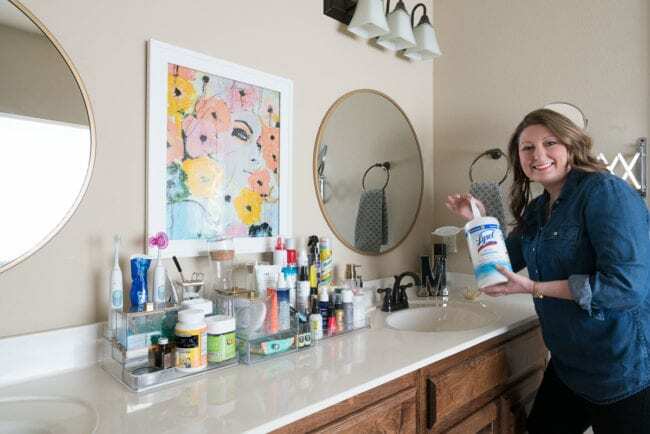 There are plenty of other things I COULD do, but I know that the kitchen/pantry, master bathroom/vanity, and office tidiness have the biggest impact on the start of my days AND happen to be the best spots to reduce daily germs. Win-win! Your routine will be a bit different based on your household members and needs, but I think this is the perfect time to get everyone involved. There are plenty of things kids can do to make their (and YOUR) mornings easier as well, so start those good habits now! Corey’s pretty awesome at tackling the dishes after dinner, so while he does that, I now knock out the following list. It’s disturbing how fast the office gets cluttered and I default to working somewhere other than the office. Some days I just need a change of scenery to focus, but my goal is to always have the option to start working in a clean office. If I check it every evening, put away things as needed, and wipe down the desk surface, I know I can start each workday feeling more professional and focused. I found a new Lysol® Daily Cleanser Spray in the home cleaning aisle at Target that is perfect for my new routine! The Lysol Daily Cleanser Spray kills 99.9% of germs on surfaces without leaving behind harsh chemical residues. I love that it’s made of only three simple ingredients and without ammonia, fragrances or dyes! This is another topic and area for self-improvement, but I’m usually rushing when I’m getting myself ready. I tend to have just enough time to not be late, which means abandoning hair brushes, pajamas, the blow dryer, etc. on the counter and flying out the door. For example, here’s what it looked like today, which is sadly a good to average appearance. I set a timer on Alexa for TWO minutes and managed to have it cleaned up, wiped down, AND even posed for some pictures. It’s seriously horrifying that I’ve been stressed walking into the messy bathroom for YEARS when I could have been fixing it in under 2 minutes a day after dinner. TWO MINUTES! 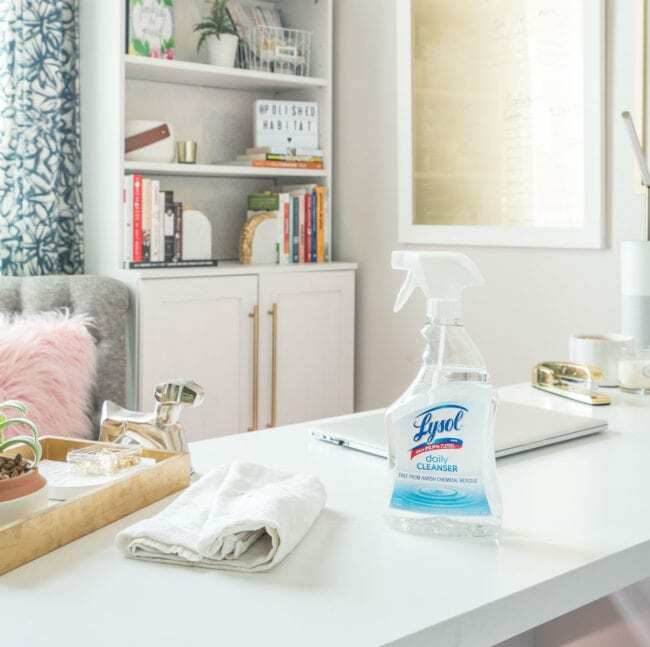 If you’re not a fan of sprays, or just like to have some other options when cleaning, there are also wipes available in the same new Lysol Daily Cleanser line. The wipes have all the same benefits – no ammonia, fragrances, dyes, or harsh chemical residues left behind. To use, simply wipe surface and let dry. Repeat for stubborn stains. Unlike other wipes, no rinse step is required! Both the wipes and the spray are safe for use on counters, cutting boards, high-chairs, and toys, so keep that in mind as you make your own routine. The new organizers I got a few months ago are working WONDERS. Even when I’m rushing, I usually put ALMOST everything back as I go. Of course, me being me, there’s always a few random items left out. Like ONE sock?!?! 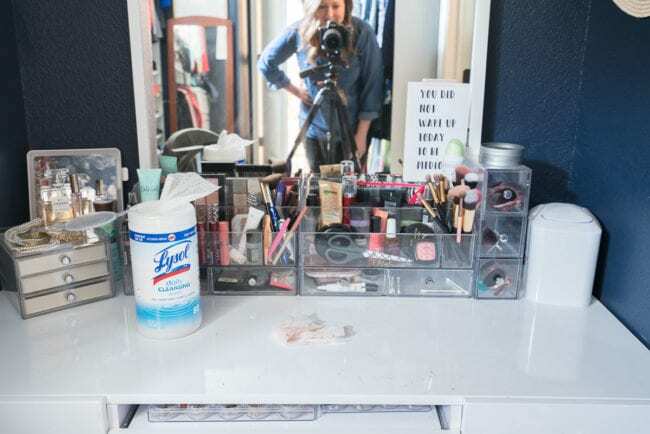 The other issue is that with things staying neater than before, I can see how dirty the white vanity top gets from makeup. Ick! Taking a moment to wipe it down after dinner and make sure everything is put away takes 1-2 minutes max. Totally worth the investment to get ready each day at a clean, organized spot! More than once, I’ve gotten in bed and realized I didn’t set up the coffee for the morning. I’m NOT a morning person, so having the water and coffee ready and only pushing one button to get it brewing is essential. By the time I’ve done the quick cleanup of the other areas, Corey is done with the dishes and I can clean up the counters and stove. I can’t even explain how happy I am to wake up to all these clear and clean surfaces. Having the routine for tackling them daily also means things can’t get TOO out of control. “Normal” housekeeping is quicker because key areas are already clean. As if that wasn’t enough benefit, the wonderful domino effect of this new routine is that the time right before bed is now reserved only for a bit of relaxing self-care – brushing my teeth, washing my face, and applying a cream to slow down the wrinkles. Maybe even a spray of lavender on the pillow! If you want to try out the new Lysol Daily Cleanser spray or wipes I’ve been using, there are a couple of deals coming up at Target. From May 26th – June 2nd, 2018, you’ll find a Buy One Get One 20% off in-store discount on Cartwheel. Side note, if you don’t use the Target app to get the Cartwheel offers, you’re missing out. As of today, we’ve saved $307.46 since we started using it. 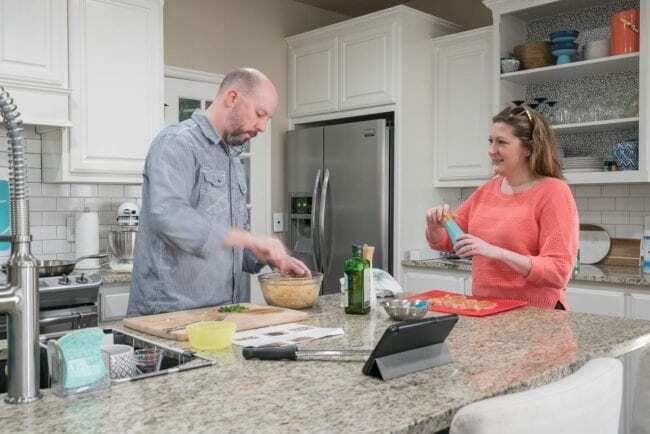 Now that you’ve seen what I’ve prioritized and how much cleaner and tidier my house is every morning, what short list of things do you think you could tackle after dinner for 10-15 minutes? Was this just a paid advertisement for Lysol spray and wipes? Did you get a chance to read the whole post? As disclosed in the first line, it was a partnership with Lysol, however, I’m TOTALLY bummed that that was all you got out of it as I work really hard to bring value to posts beyond the partnership. If it was “just a paid advertisement”, it would have been the minimum required 300 words and no actual strategy/tips that you could take away. Instead, it’s 1000+ words and shares something we are doing differently in our homes. I would have made the same amount of money with WAY less effort if it was “just a paid advertisement”. Implementing this daily clean-up time after dinner has been a HUGE help to our household. Waking up to a clean kitchen, bathroom, vanity, office and with my coffee ready to go has made me happier and more productive each day. My encouragement to you at the end of the post was to start with my routine and find your own 15 minute after dinner routine to tackle the problem areas in our own home. Ours happened to be the flat surfaces, but maybe yours are something else. I’d encourage you to read it again and see if you can get something more out of it. I NEED to implement an after dinner routine like this! I think I’ll try to tackle my list while the kids put on their pajamas, brush their teeth, and pick up their toom. That way, by the time they are tucked into bed, I’ll be ready for some relaxation with my husband. Win/win for all of us! That’s perfect! It’s so much easier to relax for the night once your quick list is done! 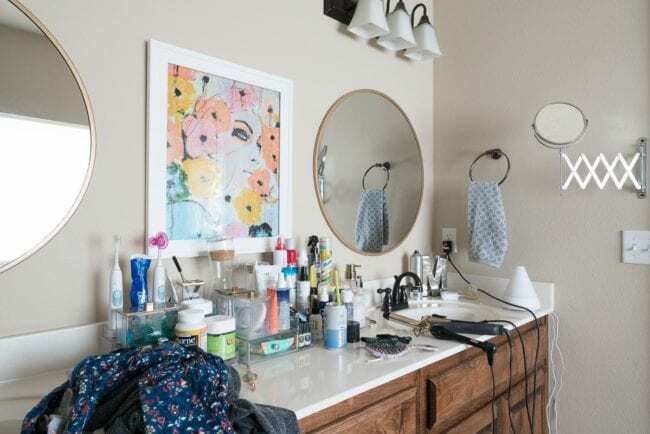 First, I was astounded at the amount of stuff you have on your bathroom countertop! I personally have no problem with it — my sink area is much smaller and therefore has less stuff. No point here other than that I am not alone! Second, I’ll actually try this product. I’m always looking for something relatively chemical free that still will clean. How does it do on gooey stuff, like dried ice cream spots from the grandkids? Greasy stuff like on my kitchen counter? 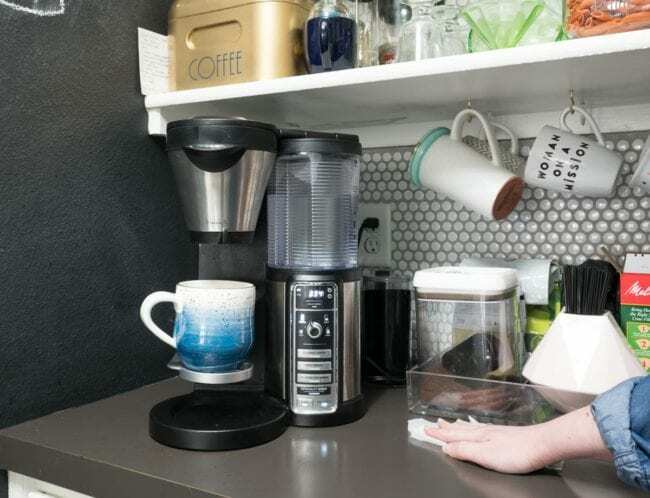 Third, no matter how tired I am, I always clean my dishes after dinner and make sure the countertop in front of the coffee is free of dishes before I go to bed. And yep, the coffee HAS to be all ready to go so all I have to do in the morning is push the button. I’m retired, so I’m under almost no stress, but I still like not having to deal with yesterday’s crap in the morning! I don’t blame you, it’s an astonishing amount of stuff. 🙂 I used to have it all hidden below the sink, but then I would never use it. Now I actually take my vitamins, use the night cream, etc. And I’ve found myself getting rid of the items I still don’t use and/or anything that won’t fit on the organizers. If something new comes in, I know that means something has to go so I think twice before buying anything new. We haven’t tackled any ice cream with it, but I’ve been really happy with how the wipes do on the glass top stove and stove handles from grease splatters. I don’t notice any difference in performance from the other more chemical-y wipes I used before. I use them within 30 minutes of cooking, so nothing is too baked on yet. It’s been a little over a month and the only time I’ve used anything else is when we’re cleaning up around an area we’ve had raw meat. In that case, I’ll use an anti-bacterial product, but the rest of the time I’ve had great success sticking with these. I’ll definitely be buying them again. Great tips Melissa! So true and so hard to do sometimes…getting into a routine of doing those little pickups and clean ups that make a huge difference. Thanks, Wendi! I resisted routines for way too long. Turns out when the tasks are on autopilot, I don’t mind them! 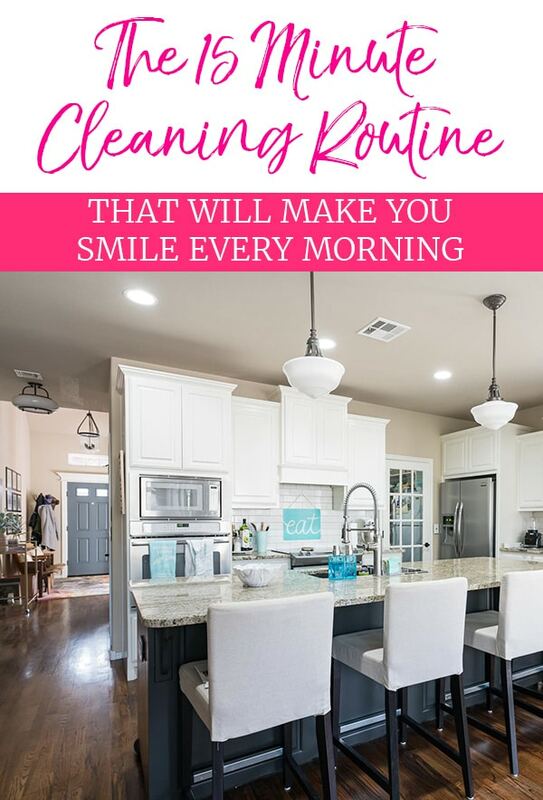 We have realized we do feel happier and ready for the day when we walk into a clean bathroom, kitchen, and office in the mornings so I clicked on a link to your post when I was searching for ideas (and motivation!) 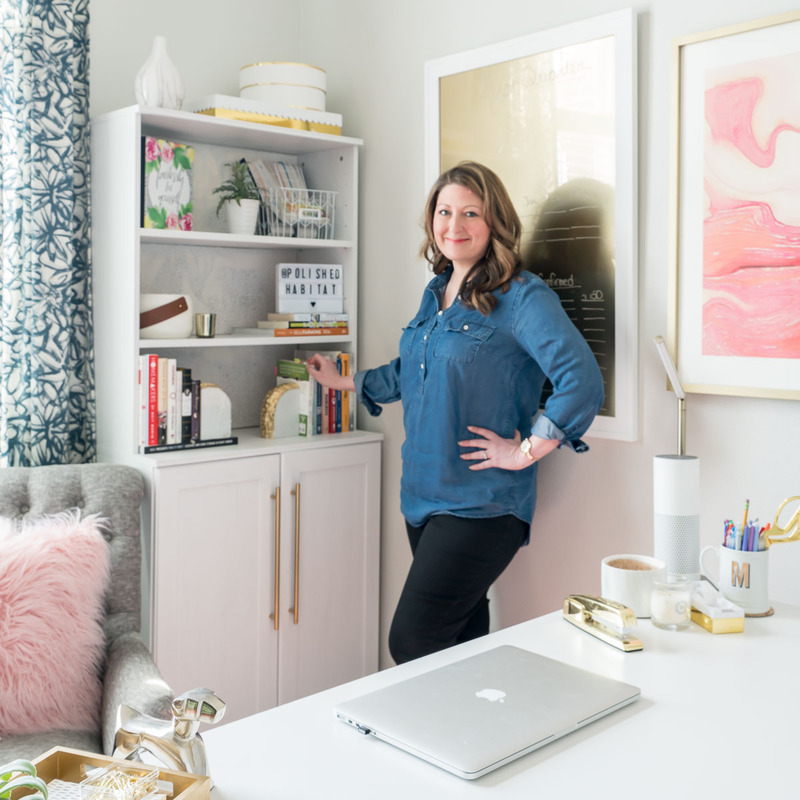 on how to QUICKLY clean these rooms a little bit EACH DAY – and your post gave me both! 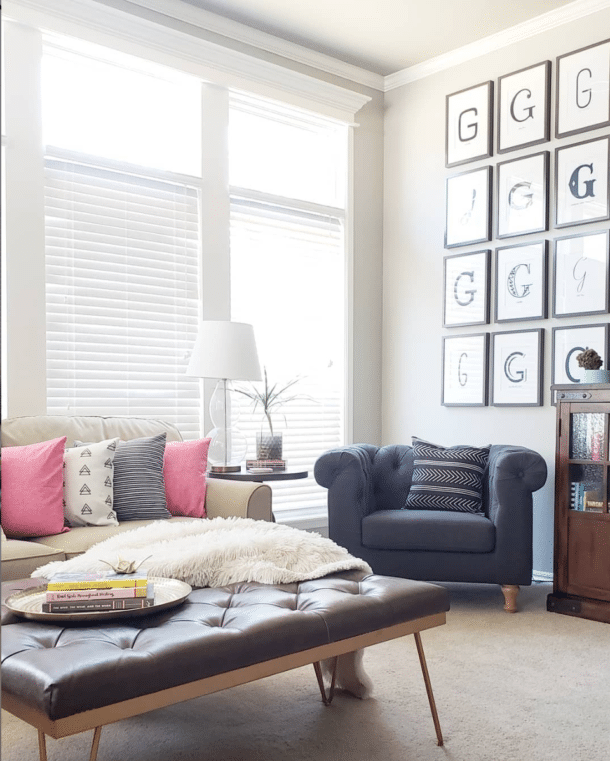 Thanks for showing how easily a few small changes can make a huge difference! Plus, I never really thought about how often I wipe the top of my desk but your post made me think about something – we have cats and they like to hang out on my desk while I work – so what nasties are traveling from their paws (which have been in the litterbox at some point everyday) to my desktop?! EEEK! Thanks for helping me think about that too! Also, I’ve added both the lysol daily spray and wipes to my grocery list – I had no idea they had a simple 3-ingredient product without all those additives! So thanks for bringing that to my attention. I don’t mind at all that they sponsored your post! Keep up your good and helpful work! I’m so glad the post was helpful! I was right with you and RARELY (like maybe once a year) wiped the desktop despite eating there all the time. That’s a great idea, Jennifer! I enjoy reading your articles and didn’t realize Lysol had a ‘simpler’ product out there. Will give it a try. 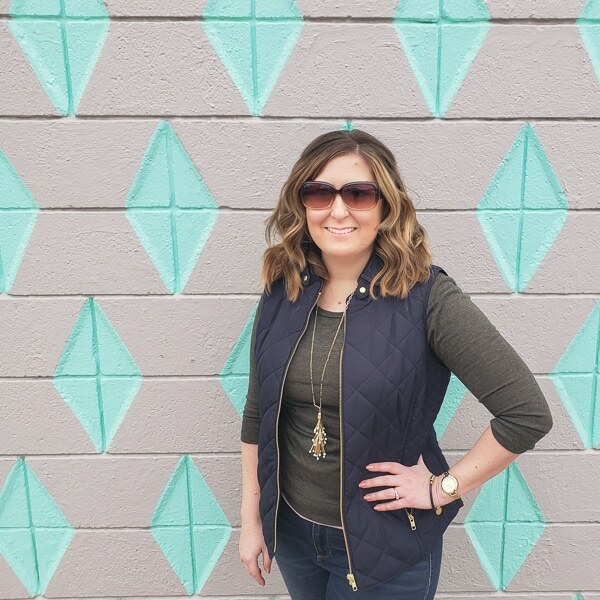 I am a bit of a neat freak, so the daily clean up has been in motion for awhile in our home, but I am always looking for ways to do it better, quicker, easier. And why wouldn’t Lysol try to have you promote something. You have a typical family with typical situations who just happens to have a lot of extra readers. Sometimes I like reading the comments just as much as your article. Thank you so much, Paula! It’s a new product and we’ll definitely be buying the wipes again and again. Thanks for the post. What brand/model of coffeemaker do you have? Thanks Vee, it’s a Ninja and I LOVE it. I think it’s this model: https://amzn.to/2Jm5SSY (affiliate link). I like that I can do a single cup with any coffee and no kcups going into landfills. And it still has a carafe as well, which is great when we have company. Before I had a keurig and a 2nd cheap regular coffee maker for any time we had guests. Great tips on making the morning more pleasant. I’m looking forward to trying the Lysol with less chemicals especially in the kitchen. I routinely use their antibacterial wipes during cold and flu season to wipe off everything (esp. door and cabinet knobs, handles, and the remote!) and also keep a container tucked by the toilet. They are great for a quick clean-up between regular cleanings, and if you have an unexpected guest (or little boys!). Yes! Keeping the wipes in the bathroom is so convenient! I’m really liking having the serious antibacterial wipes for some jobs (when we’ve had raw meat out, flu season, etc) and then the less harsh version for daily cleaning! We all know these key areas can either make or break us come morning. What I love about your post is using the Lysol wipes to take care of these areas. I am laughing at myself; but, using the wipes sounds so much easier than wetting a cleaning sponge & putting a cleaning product on it – ha! I can see myself sticking to this routine. Grab the wipes, put stuff away & wipe things down. Lazy I may be; but, if a gimmick helps me stay clean & organized I am all for it. PS: You are very upfront at the beginning of this post. I was not offend by your endorsing a Lysol product. Thank you Judy! And I 100% agree with you, it seems silly when we say it, but I’m WAY more likely to clean up regularly with the wipes over a spray and sponge or even paper towel! I like to think of it as efficient over lazy. Ha! My word of the year is “routine ” and I love this idea of an after dinner routine. I, too, resisted routiines, always thinking I was being more creative. Well at age 74 I finally figured out what most people like about routines! Even though my days are less hectic now that I’m retired and my kids are grown, I am finding creating routines helps me to stay on top of the tasks. Thanks for this great idea and I’ll be trying the Lysol product, too. YES! That is totally me. I THOUGHT I loved the “freedom” of not having routines. Funny how much more time and energy I have because I don’t waste as much time thinking about when to do basic stuff. I’m so glad you figured it out this year as well!